Today is Thanksgiving on the JR. My American friends helped me dress up for the occassion! Do you like my outfit? Right now the scientists are waiting for logging to finish on the first hole we made. That is where they drop things in to the hole that take all kinds of measurements and help the scientists learn even more about the rocks. While they are waiting, the scientists are writing reports. Yes, even scientists have homework! I offered to help, but I have wings instead of fingers. I have to have someone else type my blog because it’s too hard with wings. I will get to help some more when we start drilling again. 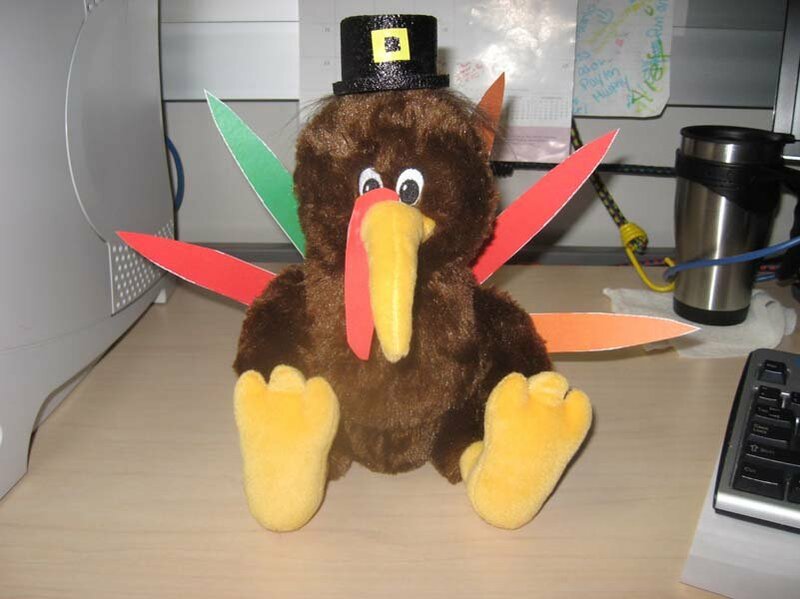 I would love to know more about Thanksgiving – we don’t celebrate it in New Zealand. If you are reading my blog and you live in the United States, could you tell me about it?